One of the best parts about bringing lunch from home is that it was handmade with love! 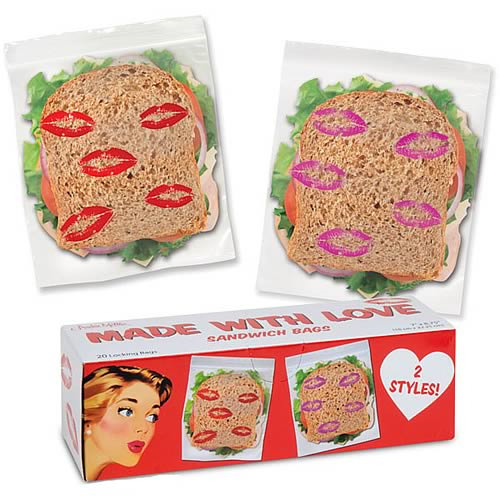 These Made With Love Sandwich Bags, with lipstick kisses, remind the person eating that they aren't eating processed food packaged in a factory, but pure love on bread with an extra helping of "I think you're awesome" on the side. Use these on your kids' lunches to help guilt them into calling you when you're old. You get 20 7-inch long x 8 3/4-inch wide clear, locking plastic bags. 10 each of 2 different designs. Illustrated box.